Nowadays, when you bring up the words record player people automatically assume the ones with two steel chrome turntables with some DJ, wearing Beats headphones, at a rave spinning EDM and trance music and wearing dark sunglasses in a dark club. But that’s not the record player I speak about. This is the classic record player with a yesteryear feel and with a touch of today’s technology all built-in to a suitcase-style enclosure. Introducing the Archer Turntable Stereo System from Electrohome. This record player has a fully automatic drive belt turntable, built-in speakers, diamond tipped ceramic needle, USB port and AUX input plug. 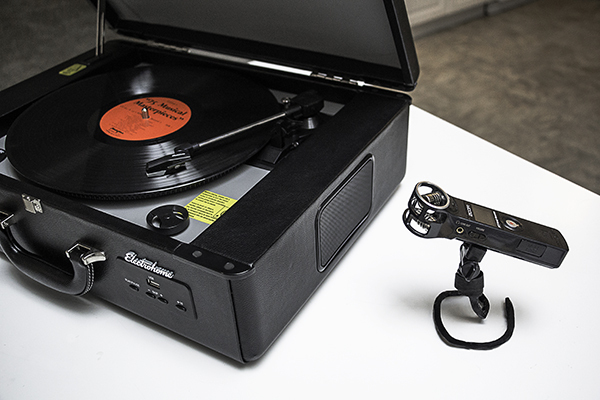 It has a hip 60’s style, black textured PVC suitcase enclosure that complements the look and feel of the record player. 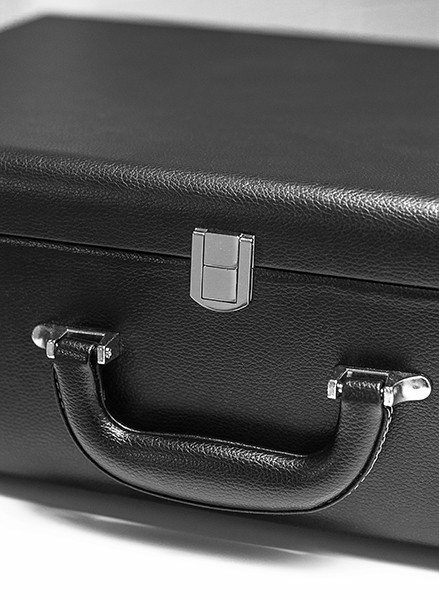 With its suitcase style handle, this record player can be carried just about anywhere you are willing to go. 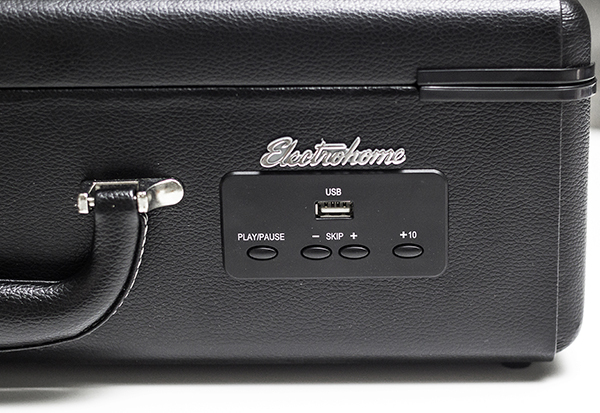 The Electrohome Archer suitcase enclosure is made from MDF wood and weighs around 17-18 pounds. The dimensions for it are 18.5″ width x 13.38″ length x 5.9″ inches in height. One thing I immediately noticed was the sound quality. The sound was crisp and surprisingly loud coming from the speakers located on the sides of the record player. Believe me when I say that the speakers can handle loud volumes without sounding too muffled or dull. I could turn the volume to its highest setting and the music was clear, loud and not distorted. I was expecting the sound to get muffled as I turned the volume up since the speakers on the side seemed small. I found an old classical record at the thrift store and decided I would try to get a record that was older so I could hear the quality of the record player. Obviously a newer record wouldn’t have the aging as an older record would have and I was longing to hear the familiar sound of a record needle spinning on the empty grooves of a record. 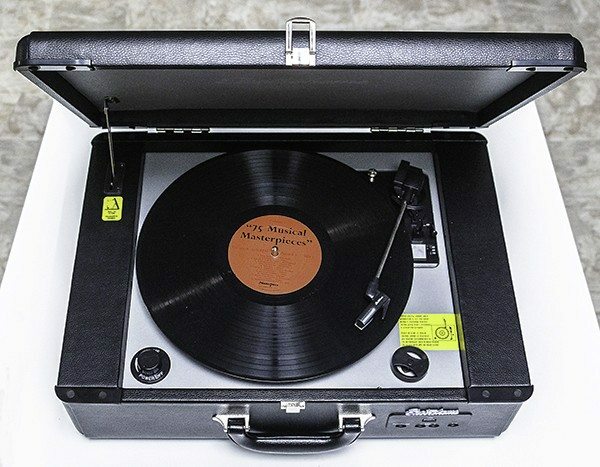 The Electrohome Archer has all the standard and traditional features of a true record player from the past such as the turntable platter, cueing lever, cartridge needle, 7″inch (45 record) adapter, and more. 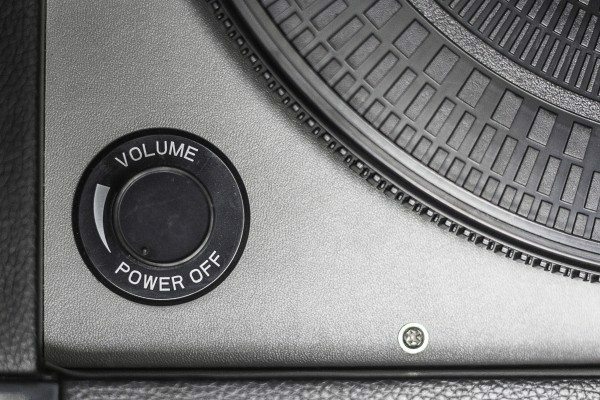 And in addition to those features, there are some extra features included that are from the present like a USB port to play music from your USB flash drive and an AUX plug so you can utilize the Archer’s speakers when you connect a device such as your smartphone, iPod, MP3 player, or other digital devices. Located just under the USB port are very basic and simple controls such as PLAY/PAUSE, Skip and +10. The +10 basically allows you to jump ahead 10 song tracks so you aren’t constantly trying to pressing the SKIP button to get to a song that you want. Unfortunately, there is no LCD screen to let you know any information on the flashdrive so you basically have to either know what songs are on the flashdrive and in what order or you have to just play roulette with the songs and just press the SKIP button until you hear a song you want to listen to. Having the LCD screen would have been ideal but considering this is a record player and trying to stay true to form shouldn’t even have a USB port. But nevertheless, the USB port is very much welcomed and really is just an added bonus. Who says you can’t have the past and present play nicely together? The AUX plug in the back is another added bonus if you want to use a digital device to play through the speakers. 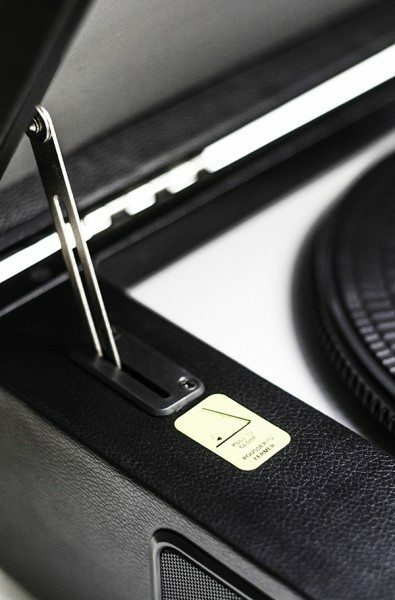 The Archer Turntable could be a big hit at a party as the music source considering you can play records, old or new, and then switch to either listening to music from the USB port or listening to music from an attached music player via the AUX plug in the back. 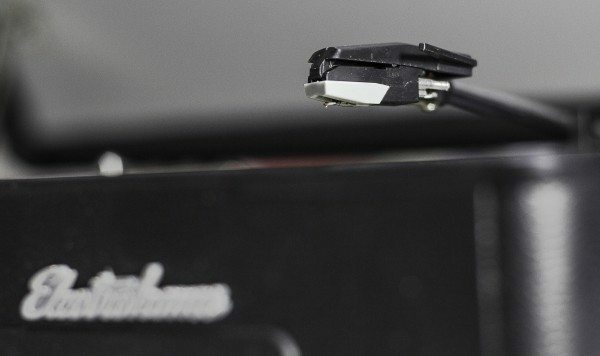 Just keep in mind, to listen through the AUX plug you have to make sure to slide the switch to AUX and to listen to the record player or USB the switch has to be on PHONO. Right next to the AUX/PHONO switch is the plug for the wall adapter. 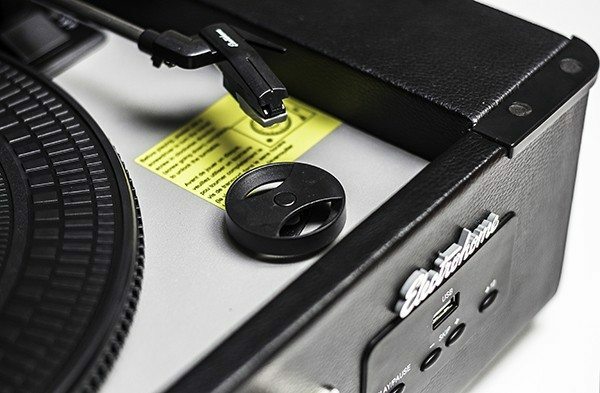 It should be pretty self-explanatory, just plug the 120v wall adapter into the AC port on the record player, plug it into the wall and turn on the record player with the POWER button knob. The POWER button knob, which is located to the left of the turntable, is also the control for the VOLUME. There is a small adapter for 7″ inch (45) records, located just in front of the cartridge needle, that accommodates the smaller records with the bigger holes in the center of the record. I like that the 45 adapter is right in plain view but has its own spot where yo can see and keep it when you are not using it. This makes it easy to keep aware of so you don’t lose it. It is there when you need it and has its own spot to be tucked away when you are not using it so there should be no chance of losing it. 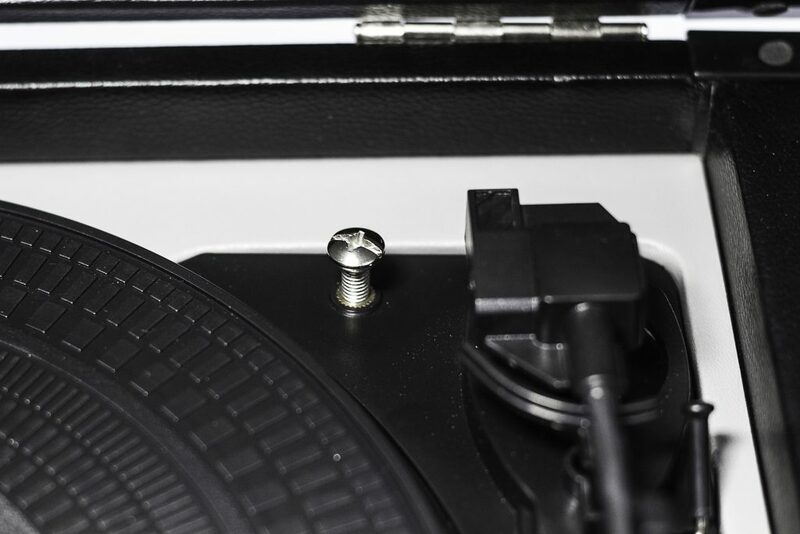 Just behind the turntable platter is a transit screw which allows you to lock down the turntable so it doesn’t spin or move around when you carry and transport this record player. You just turn the screw clockwise to allow the turntable to float and spin, then turn the transit screw counter-clockwise to lock it back down so the turntable stays lock and secure for travel. There will be times where you may want to just listen to something lighter, perhaps some jazz or classical music, or just have the volume down lower as to not disturb anyone else in the same room or you just want to settle into your own world and block out the outside noise. This is where wearing headphones would be ideal in this situation. Unfortunately, there isn’t a headphone jack provided on the Electrohome Archer. Too bad, because it would come in very handy. And speaking of no headphones, I was hoping to plug into a possible headphone jack to plug my Zoom H1N into since the Archer cannot record any music it is playing to a computer. Since I originally saw the USB port I assumed that I could do an analog to digital recording. I was hoping that I could record via the USB port that would allow me to save songs off the record to a digital format. I was wrong. Oh, well wishful thinking. So, instead I will have to pull the old technique we used to do as kids and place a tape recorder, in this case my Zoom H1N, next to the sound source, which is the Electrohome Archer, hit record and hope no one in the room makes a sound. Although, there is no SD card slot, no radio, and not even a remote control included, but what the Archer turntable stereo system has is the essence of a true to life record player of the past with it’s vinyl authentic sound, it’s 60’s nostalgic suitcase look, it’s Auto Return cartridge needle, a plastic record platter, and three various play speeds. 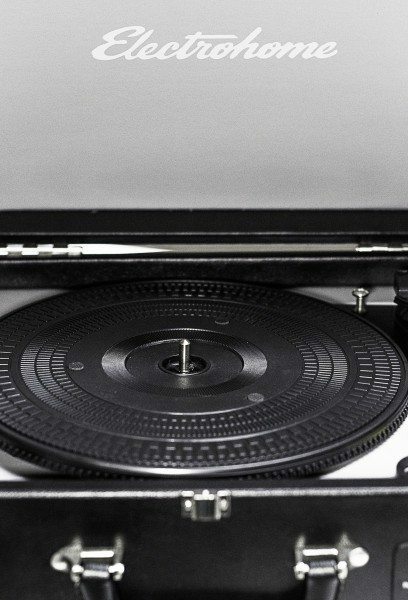 All in all, to experience this record player is not just to listen to the records it can play but to physically and carefully handle a vinyl record, place it on the turntable, gently bring the needle to a spot on the record, and bring down the cueing lever. Of course, just opening the lid of this record player will bring you to another era of times gone by when you had to manually set up your music with care so your song started right at the beginning, or being careful not to bump the record player causing the record to skip or even scratch the record. In the era of records and record players, listening to music took care and time, not like today where you just press and play. No matter if you listen to music on a digital device or a record player such as the Archer Turntable Stereo System from Electrohome, you want your listening experience to be just that, an experience. And listening to a vinyl record on the Archer is definitely something to experience. 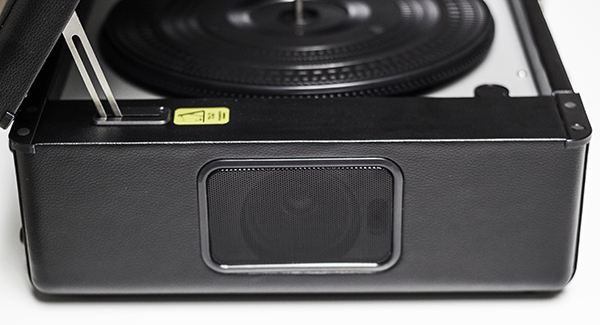 Although the Electrohome Archer may be missing some small luxuries, it is what it is, a standard record player. Having the USB port and the AUX port is an extra added bonus of today’s technology mixed in to compliment a simple, straightforward and nostalgic piece of musical machinery. Source: The sample for this review was provided by Electrohome. Please visit their site for more info.